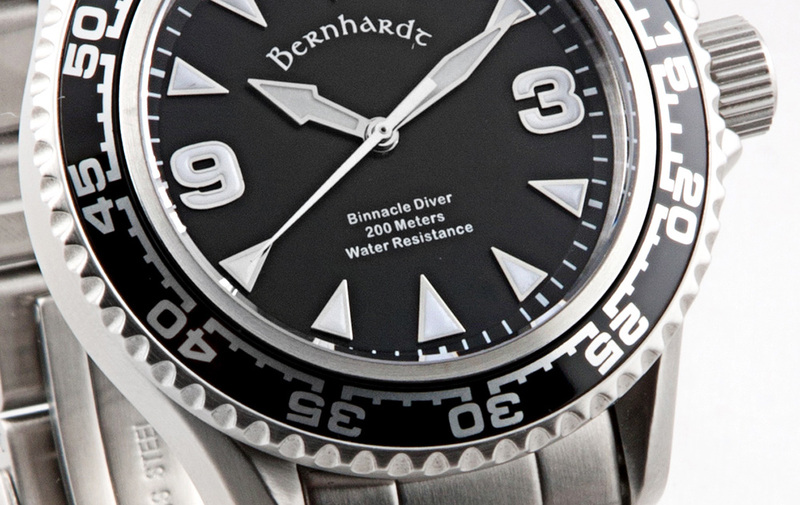 Bernhardt is a relatively unknown watch manufacturer based in the United States. Founded by Fred Amos, the Bernhardt watch company is a small operation that forgoes advertising to ensure their customers get the most watch possible for their money. It is because of this ethos that Bernhardt remains one of the few companies that can put out a quality watch with solid construction and sapphire glass for under 300 dollars. They currently have a lineup of eight designs, but the one we’re concerned with today is the Binnacle Diver. The crystal is one of the many high points on the Binnacle. It is sapphire, making it virtually scratch proof, perfectly flat and stands slightly proud of the bezel. The bezel on the Binnacle has 5-minute indicators encircling the entire bezel with symmetrical brackets connecting the numerals. The lettering is only available in silver on black. It would have been nice to have different bezel options, but the silver on black still works well with the different dial colors. The solid and highly symmetrical look of the bezel makes me think of the Tudor Black Bay–not a bad association! The case is solid steel with broad rounded lugs. 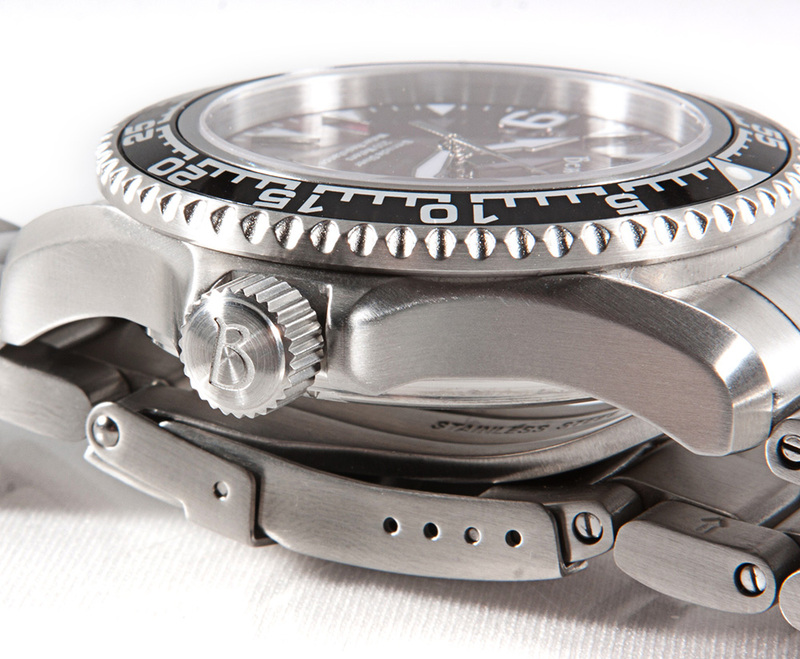 The caseback bears a shark logo as well as the water resistance and material specifications. 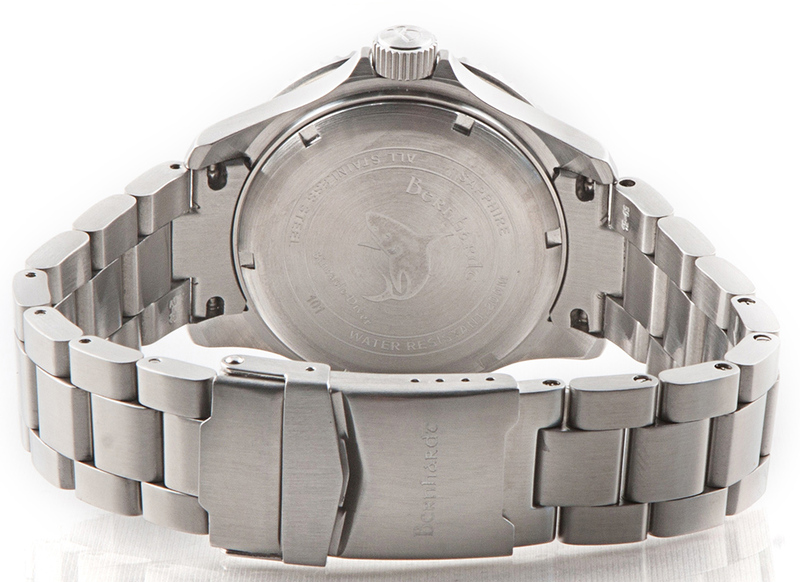 Another nice touch that Bearnhardt includes on all of their watches is an individually numbered case. This is a small gesture that makes your watch feel personal and special. The crown is that of a standard screw-down variety with a “B” engraved on the end. The dial is one aspect of the Binnacle that I’m on the fence about. It wasn’t immediately clear to me that the indicies were supposed to simulate a shark bite, but once I made that connection it was all I could see when looking at the Binnacle Diver and was somewhat distracting. This seems to be a polarizing design choice for Bernhardt–people either love it or hate it. I can’t help but feel like it’s slightly cheesy, though with that said, if there is type of watch that could pull off a little bit of cheese it’s the diver. I feel like the design is growing on me slightly, but I’m still on the fence. The hands are another area where I wasn’t particularly blown away. There is nothing wrong with them, but considering this watch has a big personality with the dial I would have hoped that the hands would back that up. Maybe a blood red second hand? The dials are available in a variety of colors that should fit within many people’s aesthetics. My two personal favorites are the black and champagne. Lume is an area that Bernhardt has struggled with in the past. Their previous generation of divers suffered from so-so lume that was reportedly patchy and dim. With the Binnacle Diver they have improved substantially. The lume appears to be evenly applied and while not of the same caliber of other divers (like say the Seiko SKX) it is still super luminova, and does the job. 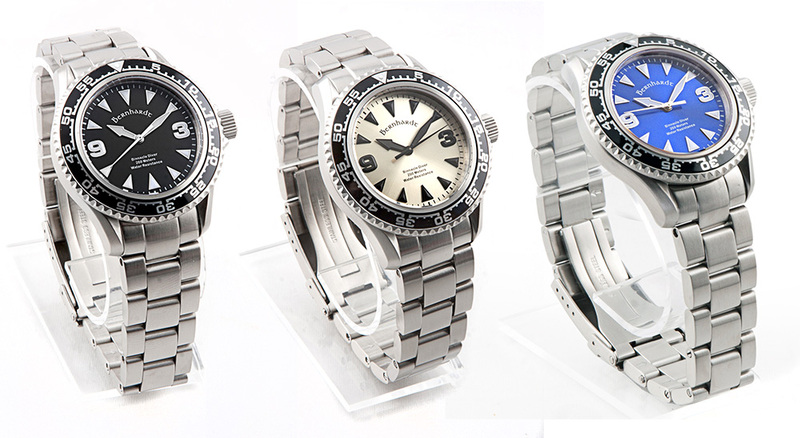 The bracelet is another high point with the Binnacle Diver. Bernhardt has always been known for their quality bracelets and the Binnacle Diver has a bracelet that lives up to the hype. Solid and substantial feeling with screw in links make this a pleasure to wear and a cinch to size. Couldn’t ask for a better bracelet. Bernhard sources Miyota 8215 movements for the Binnacle Diver. Designed by the Citizen Corporation of Japan, Miyota movements are known for their reliability and are able to withstand years of use and abuse. I wasn’t able to get the watch on my timegrapher, so I can’t speak to the accuracy, but knowing the Miyota 8215 I wouldn’t worry. The Binnacle Diver comes in a leather travel case and is very carefully wrapped and packaged. Previous watches from Bernhardt came in a spectacular wood box which has since been discontinued. The Binnacle Diver is available in Black, Blue, Burgundy, Green and Champagne. 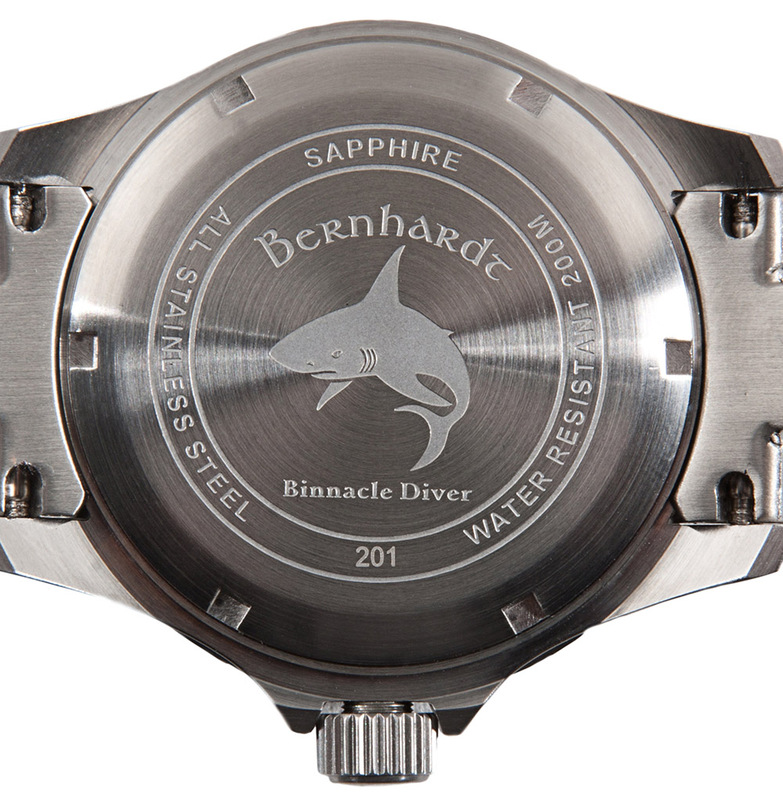 I hope you found this Bernhardt Binnacle Diver review helpful! Did I leave something out? Have something to add? Let me know in the comments. 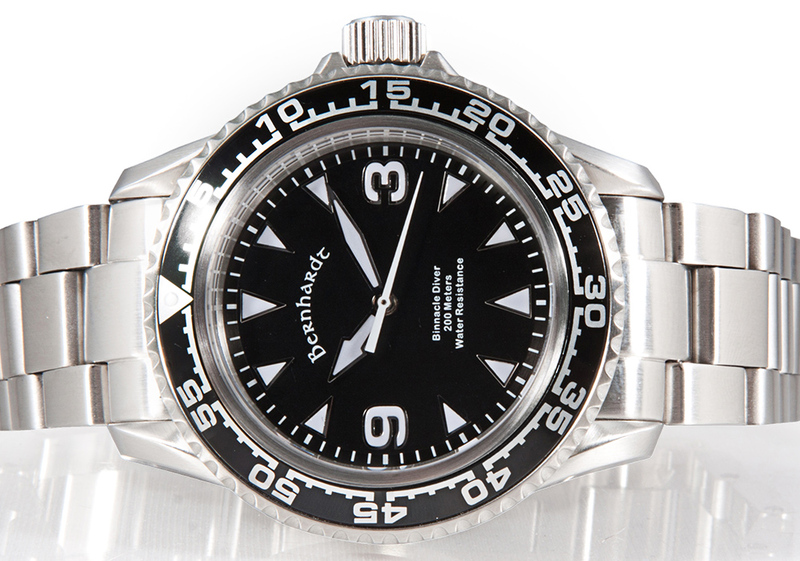 I read similar reviews and asked my wife for a Bernhardt Diver for Christmas. It has been 8 months and the watch had to be returned 4 times. The owner Fred Amos in our last correspondence informed me that he will no longer warranty the watch I bought from him. He said the watch is warranted for normal wear only. How do you abnormally wear a watch? I am not a stunt man, or cowboy, I don’t work with explosives, I don’t demolish buildings, I wear my watch daily, while swimming running and working a mostly office job. Hopefully my watch comes back and performs as would be expected but just know that the 2 year warranty is totally at Fred’s discretion. Wow, that’s too bad you’ve had so much trouble with your Bernhardt watch. I only had access to the watch for about a week before I wrote the review, so I can’t speak to the durability of their watches over any greater period of time than that. Was it repaired each time you sent it in or replaced with a new watch? If it was repaired each time, I’d imagine the fogged crystal and detached numerals are related problems. Either way, a sturdy tool watch shouldn’t have any of the issues you’ve described. Thanks for sharing your experience!